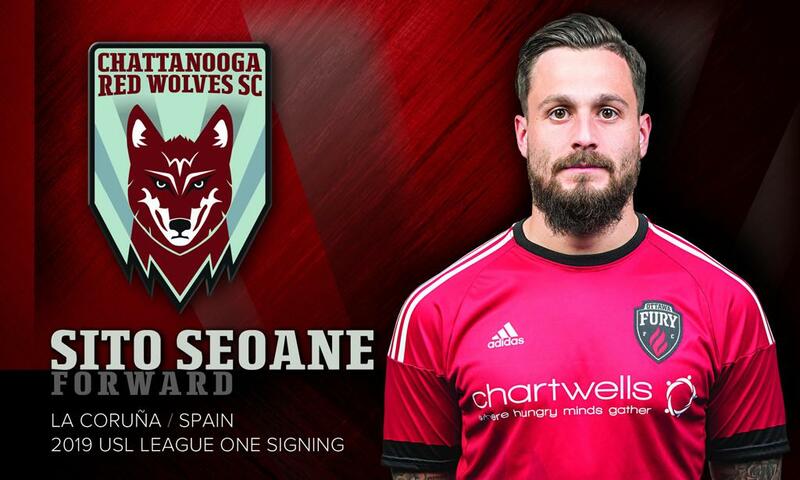 CHATTANOOGA, Tenn. (Dec. 19, 2018) – Chattanooga Red Wolves SC has signed American-born Spanish forward Sito Seoane to its USL League One team. Seoane will join the franchise for its inaugural season in 2019 from Iceland Premiere League’s UMF Grindavík, pending league and federation approval. Seoane joined Grindavík in May of the 2018 season, appearing in 17 matches and adding five goals. According to Chattanooga Red Wolves SC Head Coach and Technical Director Tim Hankinson, his playing style fills a gap for the Red Wolves roster. Prior to his stint with Grindavík, Seoane spent a season and a half with USL Championship’s Ottawa Fury FC. During that time, he appeared in 31 games, logged nearly 1,500 minutes played and added eight goals. He made history during the 2017 season, scoring the fastest goal in Fury FC history. Seoane put the ball in the back of the net in just 38 seconds during Fury FC’s Canadian Championship match against FC Edmonton. This strike also clocks in as the second fastest in the history of the Canadian Championship. From 2015-2017, Seoane had a two-year stint with teams in the Iceland Premier League, scoring 16 goals in 44 appearances. Prior to that, he rostered with USL League Two’s Austin Aztex for two seasons. He led the club to win the 2013 USL PDL Championship with nine goals and four assists and was named the playoff and championship game MVP. He joins the Red Wolves roster as the eleventh player signing for the club. Other signees include Richard Dixon, Colin Falvey and Steven Beattie. The Red Wolves will make their debut in USL League One play on March 30, 2019 as the club travels to Dallas, Texas to face North Texas SC, a League One club operated by MLS side FC Dallas. The Red Wolves will face Forward Madison FC for the club’s inaugural opening night the following week on April 6. Kickoff is 7 p.m. local time. Founded in 2018, Chattanooga Red Wolves SC is a professional soccer club in Chattanooga, Tenn. The USL League One founding member is led by business executive Robert (Bob) Martino and coached by Tim Hankinson. The club has plans to construct a new state-of-the-art 5,500-seat soccer-specific stadium in Chattanooga for the 2020 season and will play its inaugural season at David Stanton Field at Chattanooga Christian School while the stadium is being built. For more information, visit www.chattredwolves.com.